The morning of my 30th birthday, I showed up for breakfast at Palmer Station wearing all black. I felt I needed to mourn the passing of my youth. Thanks to my friends, family, and coworkers it quickly became the best birthday yet! Then, I held my first skype session from Palmer Station with my hometown high school in Rayland, OH. After a great introduction from my wonderful sister and Spanish teacher, I got to proudly share my Antarctic adventures with upcoming graduates and my previous teachers. I received birthday wishes from my mom and dad who came to show their support. And to top it off, the students made signs "Happy Birthday Nature Nat" and serenaded me birthday wishes in three different languages! The chefs at Palmer Station made a delicious birthday dinner of my choice (rice pasta with white wine sauce, chicken, and veggies with a chocolate-peanut butter cake). 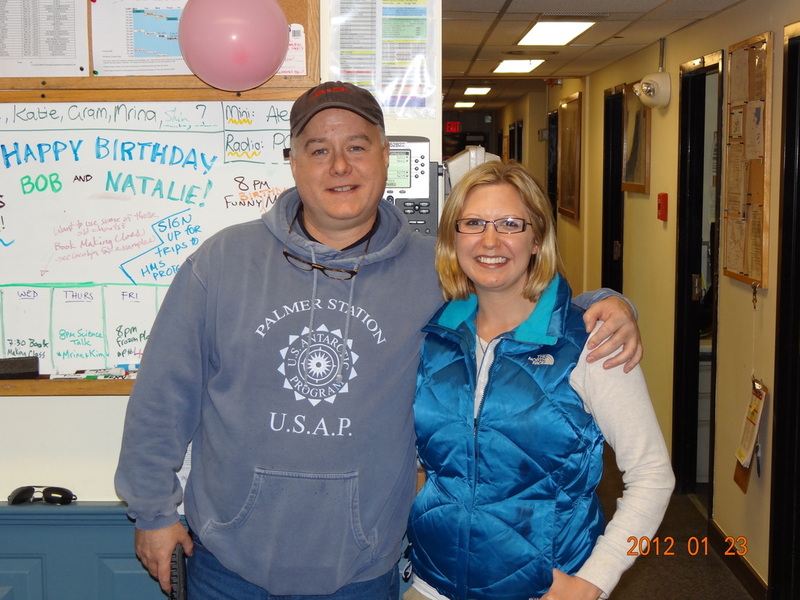 The station manager and I both celebrated our milestone birthdays with pride. Thank you Palmer Station!